Our Silica Sand Deposit is a sub-angular grain from Lake Michigan. Just 10 miles off the coast of Lake Michigan, we have decades’ worth of sand reserves. Our sand has a typical silica content of 95%, 2.6% Alumina, 1.4% Potassium and smaller amounts of Iron Oxide, Titanium Dioxide, Calcium Oxide, Magnesium Oxide and Sodium Oxide. 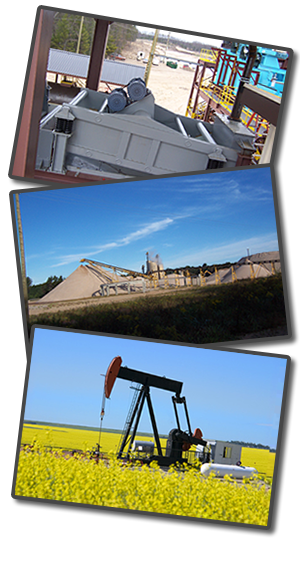 Nugent’s manufactures silica lake sand with production capacity of over 1,000,000 tons per year. We mine via a chain drive boring hydraulic dredge at a rate of 500 – 600 tons per hour. The sand is water washed to remove clays and silt and processed through a water flotation cell to control the Acid Demand Value. Next, we classify the washed sand by grain size to produce distinct grades of sand which are inventoried in large stockpiles. The stockpiled sand is conveyed to dryers in order to maintain a constant dry sand silo inventory. The coarser sand stockpile is further processed through a dry screening operation producing two additional grades of sand which are stored in individual silos. Nugent uses a pneumatic blending system to create custom sand blends with an A.F.S Grain Fineness of 39 – 80 to meet individual customer sand requirements. Our superior blending capabilities and quality control procedures allow us to deliver sand within +1/-1 of a specified A.F.S Grain Fineness number. Nugent utilizes a variety of transportation methods to deliver its products. Clients often have their own trucking partners pick up their shipments at Nugent’s two lane shipping facility. For client’s needing shipments during non-working hours, Nugent has two self-loading sand silos. Nugent also owns and operates a rail loading facility. We own and operate two (2) trucks used to deliver local bulks loads of foundry sand (25 or 50 ton) on an as-needed basis. We strive to meet customer needs and will be as accommodating as possible.